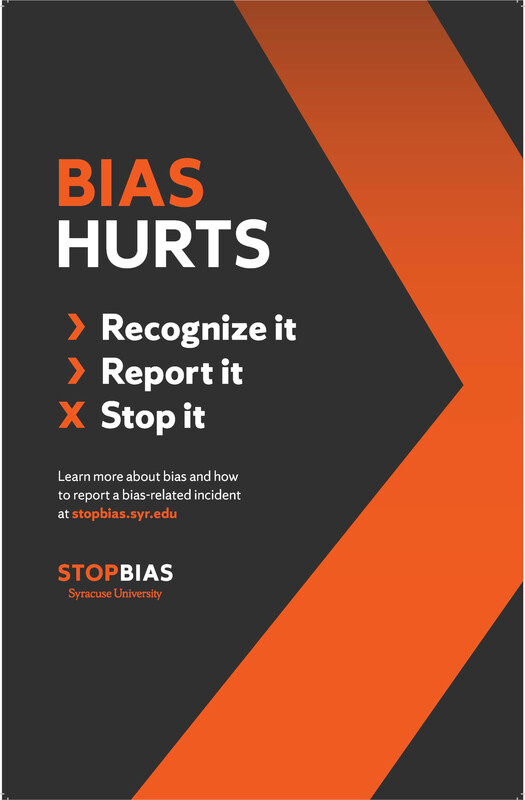 STOP Bias, an initiative at Syracuse University that educates the campus community about bias and provides resources to report and receive support for bias-related incidents, is relaunching with an updated online reporting tool and new web, print and digital assets. These improvements are intended to educate the campus and ease the process of reporting acts of bias. acts of bias at Syracuse University. Learning how to recognize bias is the first step in the STOP Bias process. Examples of bias-related incidents range from racist or derogatory images/drawings to using a slur to identify someone. The new web page further explains bias and its relation to, but differentiation from, hate crimes. “First and foremost, each of us has a responsibility to identify our own biases, to check how they may be problematic and to correct them. In tandem, if we are in a situation where we witness a bias-related incident, we must be a responsible member of the Orange family and intervene when it is safe to do so,” says Rob Hradsky, senior associate vice president and dean of students. Once a person has witnessed or experienced a bias-related incident on campus, they can use the online reporting tool to report the incident to the University. The reporting tool can be used anonymously or an individual can share contact information for follow up. After a report is made to the University, the submitter will receive an automatic acknowledgment of the submission. If requested, this acknowledgment will be followed by contact from the University within 48 hours. The individual will be contacted by either the Office of Equal Opportunity, Inclusion and Resolution Services (EOIRS) or the Division of Enrollment and the Student Experience, depending on the nature of the reported incident. The Department of Public Safety, Title IX office and the Counseling Center will be notified when appropriate. Materials regarding the STOP Bias initiative have been disseminated to residence halls, South Campus residents, off-campus students and dining centers, as well as to faculty and via digital platforms. To request materials, contact the Division of Enrollment and the Student Experience at 315.443.3514 or email stopbias@syr.edu. In addition to the communications materials, training opportunities are available through EOIRS.